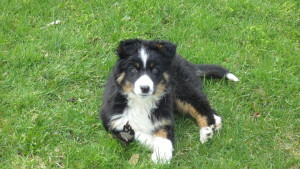 Seven weeks ago we rescued an Australian Shepherd-mix (?) puppy. Moshe was dumped at our farm one stormy afternoon. He arrived soaking wet and only 12 pounds. 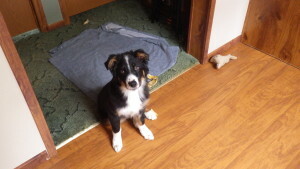 He has grown into an active four month old- based on our assessment and the vet’s best guess. He has also gained 15 pounds! Moshe is smart and busy- a joy and a challenge. His discharge instructions say, “no running, jumping or strenuous activity…keep indoors and calm for 7 to 10 days…” He is MISERABLE!! We have had a few quiet walks on the leash but it’s not the same as playing ball for 30-60 minutes each day. It will be hard to keep this farm dog still. 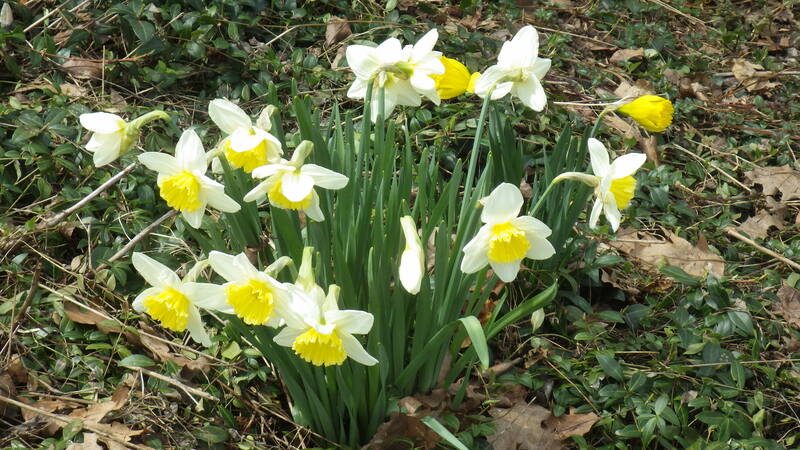 Training a puppy is hard work…especially when the tulips are in bloom and every waving thing is an enticement to “capture”…so far the big bumblebees have been elusive, but the tulips are suffering a bit. 🙂 Hopefully he will learn the do’s and don’ts of farm life…quickly! Raining Cats and Dogs and We Got a Dog!! Several years ago our old farm dog, a husky mix named Quixote, went to spend his final days as my daughter’s pampered house pet. Quixote passed away two years ago at 13 years of age. 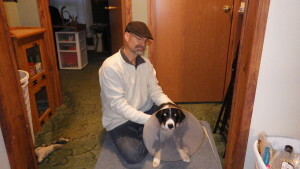 Since then, we have gone back and forth about getting another dog…hubby wanted a house dog and I said, “Too much trouble with the Day Care.” So we remained dog-less and seemed okay with that. Two weeks ago in the middle of a severe storm, I glanced out my office window to see a puppy dash across my front yard and crawl under the porch. We coaxed him out and brought him inside to dry off. We called our neighbors to see if any of them had gotten a new puppy. In the past two weeks, we have posted on pet sites, called the Humane Society and checked the newspaper lost and found. We came to the conclusion that someone took a drive on that rainy afternoon and dumped him just below our house. We are the last inhabited house and it is not likely that a puppy this small could wander so far from home…AND be wet but NOT muddy. We named him Moshe (mO-sha) which is Hebrew for Moses because we pulled him out of the water….TWICE. First on that rainy afternoon and the next day when he toppled head first into the pond while trying to figure out who that dog was in the water. 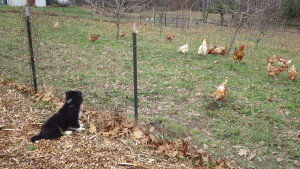 Moshe seems like a pretty smart little fellow and has even assumed the role of guard dog for the chickens. He is growing like a weed and learning new things everyday. We weren’t looking for a new dog but it looks like this one is here to stay. I am thankful we didn’t get a cat! Another beautiful morning on The Ridge. It was a bit chilly when I went out to feed the animals, but the sun was shining and it was getting warmer. After breakfast, I went out to weed the strawberries and blueberries….we have ten 20 foot beds of small fruit. I was pleased to see the new strawberries, that we planted in the fall, had survived the harsh winter…I even found a few volunteer plants that I transplanted into the places where there were gaps. Because we build our beds using the lasagna method and top dress with wood chips, the weeding is very minimal…mostly those pesky dandelions that defy all efforts to eradicate them. I’m thinking we may have to eat some of them one of these days. Hubby likes dandelion greens. I took a break for lunch but made it quick because the raindrops started falling…Hubby took a break too and raced outside to run the mini tiller through a few beds so I could plant early crops. We don’t till for weeds, we till to mix our beds up and loosen the soil. Plus, the tiller makes two perfect furrows, evenly spaced so that I can just drop in the seeds and be done. I planted two 50 foot beds of peas and a few spaces around the garlic with spinach, lettuce and radishes. If the rain stops, we’ll work on tightening up the fence so we can let ALL of the goats outside. Maybe tomorrow I’ll show you the surprise! Probably the longest winter I have ever experienced is finally over!! When I posted last month, we were still dealing with snow and freezing temperatures. The past week, the weather took a turn for the better and we are now able to work outside and enjoy some pleasant days. Spring clean up and pre-planting has begun. This past weekend we moved the laying hens and our two roosters from the big coop to the orchard coop in preparation for the arrival of 125 meat chicks. 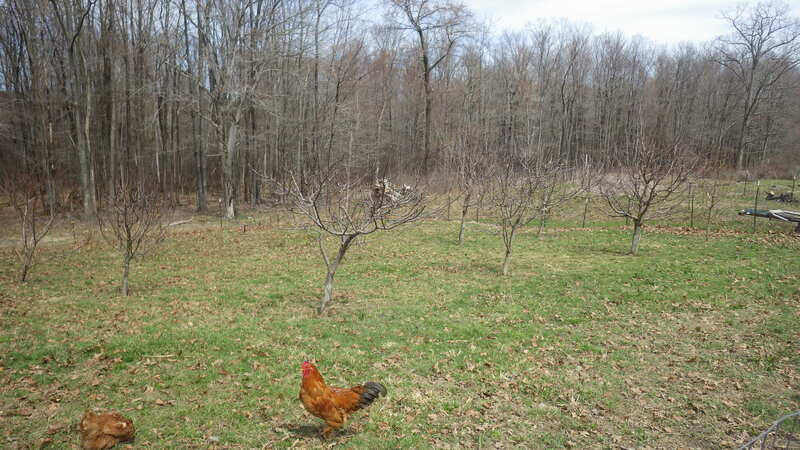 The orchard gives the layers plenty of room to run and scratch…with the added benefit of the chickens gathering bugs that are attracted to the fruit trees. I was able to do some garden cleanup last week. 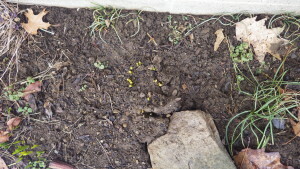 I weeded the asparagus beds and several empty beds…soon it will be time to plant peas. 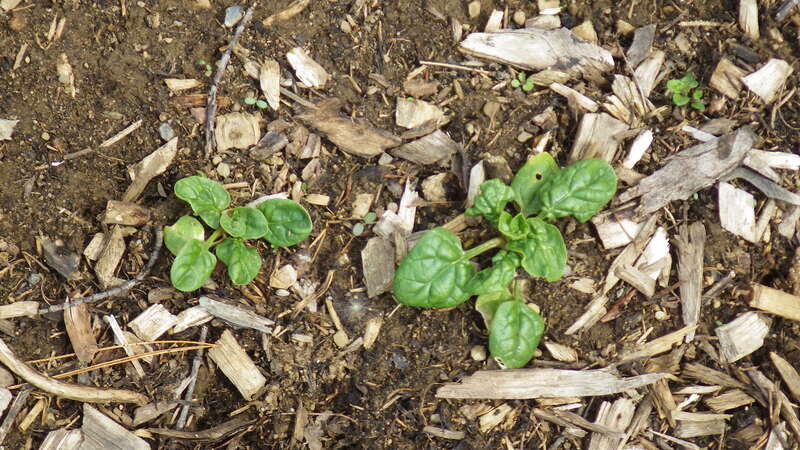 The garlic is up and I found some spinach that wintered over and is greening up nicely. YUM!! 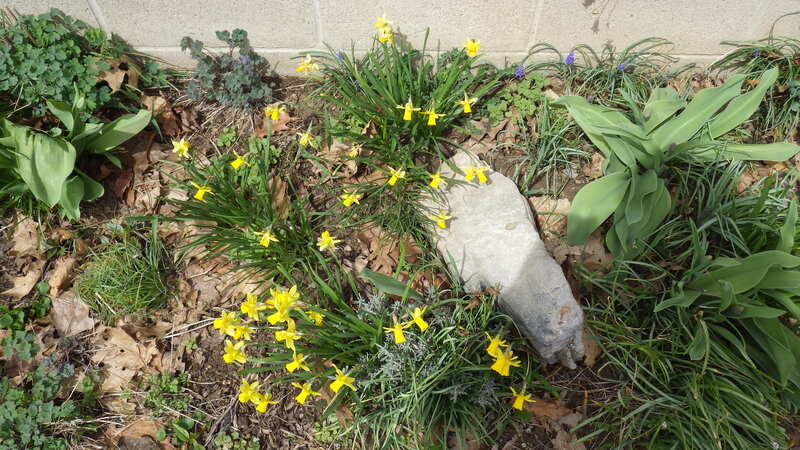 The daffodils are really beginning to open up and add some color to the flower beds. It’s always a delight to finally see green and growth after all these long months. 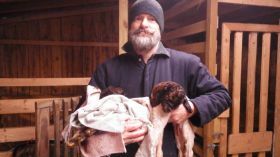 I’ll be posting more on our 2015 projects soon…keep watching for updates on the goats, the new garden beds and a surprise addition to the Ridge. The weather on the Ridge is finally starting to break. 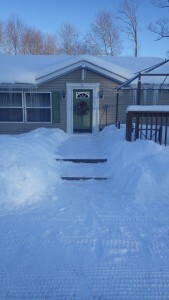 Even though the angel in the front yard is still buried and yardstick on the deck shows 15 inches of snow. 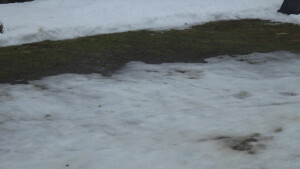 We’re seeing some signs of green. 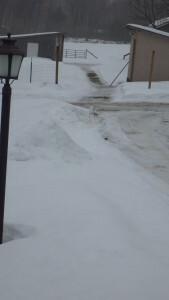 The pathway to the barn and the driveway have a few patches and up against the front of the house, I see some bulbs beginning to poke out of the ground. 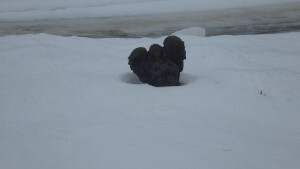 We’ve had a few weeks of wickedly frigid temperatures and tons of snow. The yardstick on my back deck measures 25 inches of snow. 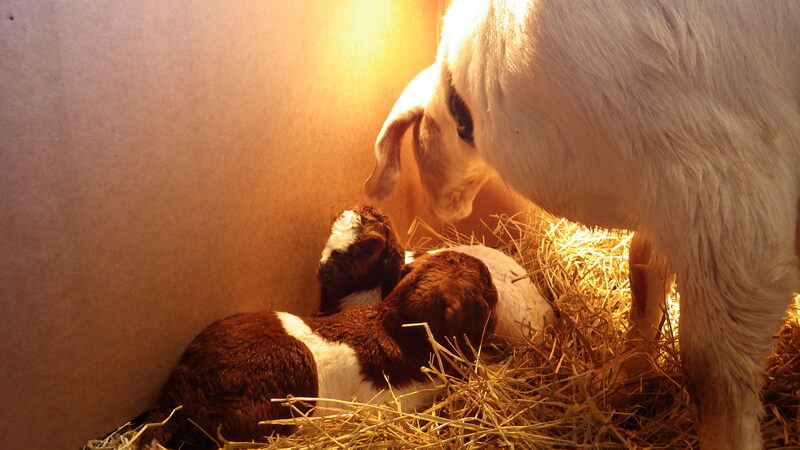 In the midst of the severe weather, we had baby goats…on February 21st, Ariat had triplets and Daffodil had twins. 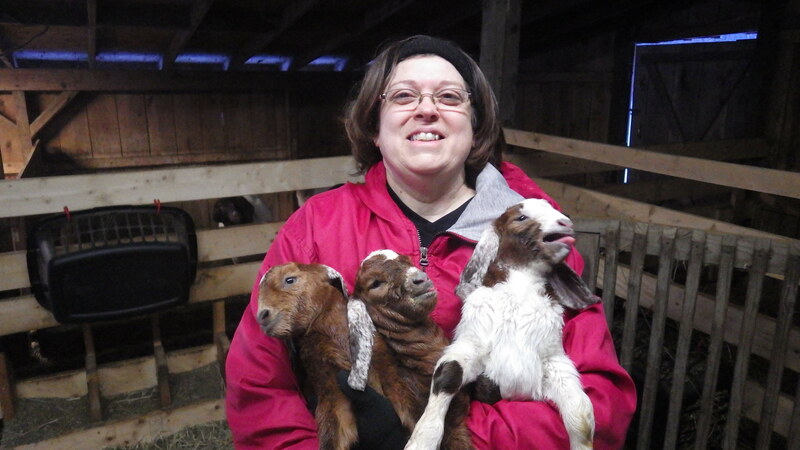 It was a bit crazy walking into the barn for evening chores and finding five kids…especially since Daffodil was not caring for her kids and we had to perform some serious warming techniques to bring them back from the brink of death. 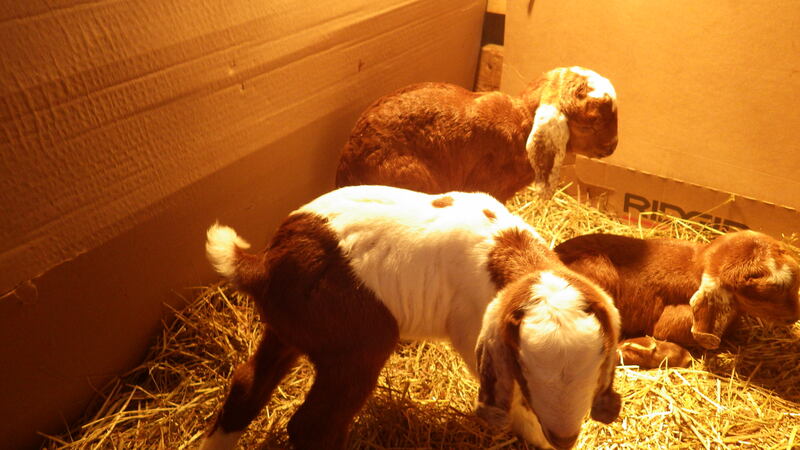 Ariat’s kids were all around eight pounds and lively. 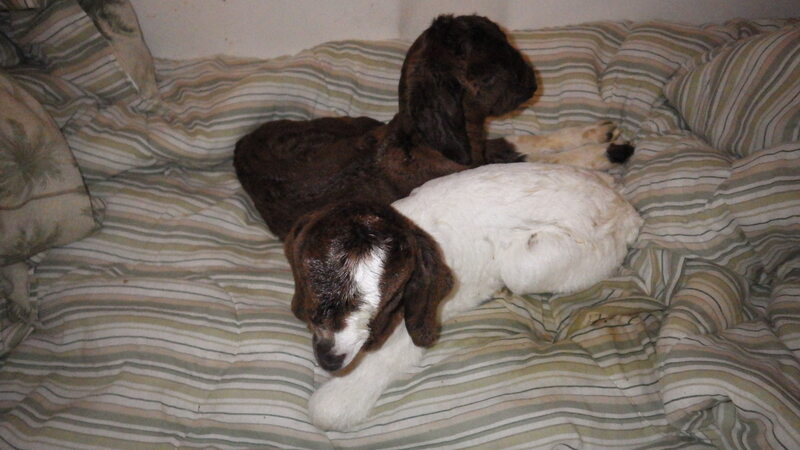 Over the weekend we worked with Daffodil and twins, attempting to get them to nurse and her to care for them. Monday night the temperatures dropped to minus 28 degrees and she crowded them out from under the heat lamp and we lost them….we were devastated. I especially felt bad that I did not bring them inside. 🙁 It was a hard day. 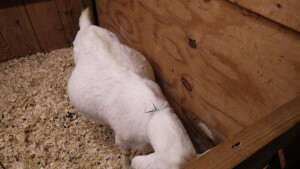 On Wednesday, Kenton went for noon barn check and discovered that Lucky was birthing. I was able to be there just as baby #2 arrived and helped assist baby #3 when he was born breech. 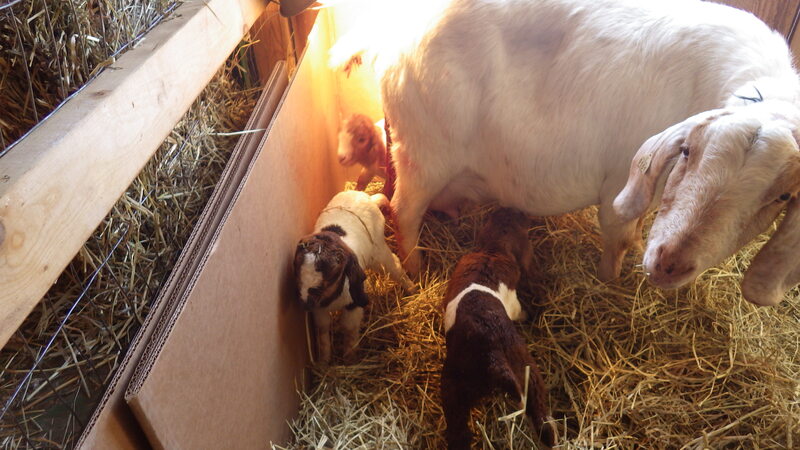 Two sets of triplets!! We have three new bucks and three new does and some different colors in our herd. These babies are growing and doing very well. Lucky and Ariat are great Moms. Stay tuned for progress reports. The snow just keeps coming!! Last night we had an additional 3-4 inches. 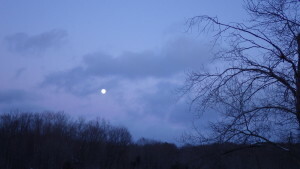 But we have sure had some beautiful moments…sunrises, moonsets and sparkles that cannot be captured on camera. We take each day as it comes and are thankful for health and a warm home and a chance to enjoy all of the wonders of God’s creation. 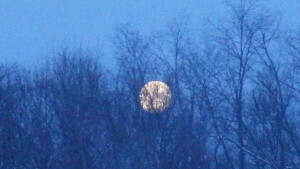 Last night was the full moon..it was beautiful rising over the pasture just at sunset. 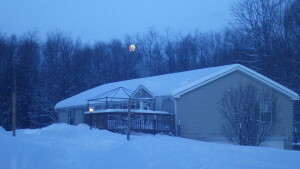 But by bedtime, the sky had clouded up and we got 3-4 more inches of snow overnight. Lucky apparently is not phased by the full moon or the freezing temperatures. She will take her own sweet time. Last year we were gone for a month and Basil was locked in his stall for the safety of our animal caregivers. When we returned home, we felt sorry for him and just let him run with his girls for the summer. In October, he was returned to his stall for the winter. Two weeks later, Anemone kidded. We have been waiting and waiting expecting that someone else would kid shortly afterwards…no such luck. Anemone’s boys are now three months old and still the others are waiting. 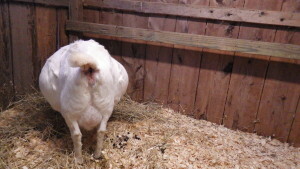 Lucky and Ariat seem to be due any day but so far…nothing. This year we will complete Basil’s outdoor run and next year we will not play this guessing game. Until then, we wait! !